Ten Things I Know To Be True | What Is? 1. I can over think things. When I found out that one should not think too hard and just go ahead and enlist their answers to this question, my mind kept wallowing on what I think could be a good idea to put on this list. I just kept doing that until I am quite dizzy and not knowing what to put in anymore. So, I’ll just made a rule to let myself be myself and not complicate things when I do not become myself. Over thinking can sometimes spoil the broth. I shall let myself relax. 2. We all got Faith. In just about everything we do, we exercise our faith, we have it inside each of us – when sitting on a chair, riding in the car, talking to someone on our mobile phones, cooking our favorite meals, believing in what we can do, believing on what God can do, and many more. We all got faith, it’s the object of our faith that differs. And although we may be totally sincere in our faith, sometimes, we can get all rumbled up in a wrong one which could lead us to a tragic end. So that’s why it’s of great importance to know where you place your faith and if it really is sincerely on the right track of the road. 3. I felt a bit sad when Pluto got voted off the nine planets in the Solar System. After years of research, they found out that Pluto is not really a planet, it’s just a comet or something else that is part of the space. It reminded me how certain things in life don’t stay the same and that you had to let it go, let it be and accept it with all your heart and understanding. Though there may be confusion and refusal and pain, nothing ever really stays the same. Believe that there’s gonna be a light at the end of the tunnel someday. 4. You are only as strongest as your weakest point. I believe that blisters, wounds and scars are not designed just to give us throes, tingles and twinges. It’s meant for something more that’s why we go through it sunny bright or chilly winter night. How else can we value successes if not for failures? How else can we appreciate victory without defeat? How else can we be grateful for mercy and grace and love when we know we don’t deserve any of it because of all we’ve done wrong? How else can hope mean something more when we haven’t gone through desperations and tough times? The world may be made out of sugar and it crumbles down, but, don’t be afraid to stick your tongue out in the air and taste it. Perhaps strength doesn’t reside in having never been broken.. But in the courage required to grow stronger in the broken places. 5. Hope is fluffy and whole lot of lovely. Somebody once said, we see the impossible everyday. Impossible is trying to connect in this world, trying to hold on to others when things blow up around you. Hope is a fireball of doing the impossible, believing the unbelievable, loving the unlovable. It teaches us to swim the depths of the ocean as if we can gasp air in any minute. It is a mustard seed and a very close relative of Faith. To have Faith is to be stubborn, to know the happy endings exist, to believe the story is not over even though it feels like it is. It is for the crazy and the brave. It even move mountains. It’s the smile in the frown, the courage in the fear, the tranquility in anxiousness. It’s the many oxymorons. It’s hope and it’s beautiful. Jeff Goins once said, If you want to be something – anything – a good place to start is with doing it, regardless of how you feel. When I started blogging/writing, I never knew how this would all turn around over time. I was never born a writer and I believe writers are born and not made. It is innate in them, you know, it’s like writing comes out naturally like a hug or kiss you voluntarily give to someone who is very close to you. It’s like their best stature – their moment of writing. And there I was one day, trying to squeeze myself in that same kind of art where your experience makes a lot more fun and confusion takes a toll on your understanding when it’s all written down. And now, my secret love affair with words and poetry are all out an open field. I’m quite happy reaping its harvest. And yes, it’s true what they say about practice. Do it. Be it. No matter what the television says nor the magazine’s latest issue nor the radio’s nonsense advertisements. The heck with the world! You are still beautiful. Wearing your retainers and big dark glasses with all your sweatpants even when you’re twenty-two doesn’t make you less interesting. Your mocha toned skin just suits you right. When they say that boys don’t cry and you, on the other, do when you were happy because your baby sister received her valedictory award at school or when you got your heart broken from the wrong girl, that’s reasonable. People in this world sometimes can be discouraging and they will peel you off the sunbeam you’re radiating. As long as you got love sprinkled with faith and hope and grace, you are beautiful. Rise above the situation and hand them flyers on bravery, strength and courage because you are beautiful. 8. Unlike Superman, Batman can’t fly. Even in that situation, Batman didn’t stop helping, he didn’t stop caring, he didn’t stop being a hero. We are our own heroes even if we don’t get to fly and have our own superpowers. The only thing we can bring forth as a weapon in this course of life is the courage and hope and faith to the One who can empower us. Offering our service to others need not to be grand, in our own little ways, our random act of kindness to a friend or a stranger can make a difference. 9. Fear is a friend that’s misunderstood. We all have fears. It creeps in every night in the dark. Fear is a natural emotion designed by God, however, fearfulness is living in a state of fear and is not designed by God. Sometimes we don’t wanna face our giants and we just wanna run. But if you do and you bring with you the voice of Truth, you’ll see that the stone is just the right size to put your giants on the ground. The waves don’t seem so high when you’re on top of them looking down. You will soar with the wings of eagle when you listen to the sound of Jesus’ singing over you. 10. I go to seek the Great Perhaps. We need never be hopeless because we can never be irreparably broken. We think that we are invincible because we are. We cannot be born, and we cannot die. Like all energy, we can only change shapes and sizes and manifestations. Our own Great Perhaps is out there somewhere in the woods across the sea in the dark forest. We may encounter thorns and bushes and labyrinths on our way but never fret and never worry. Choose the labyrinth. The labyrinth blows but choose it. There’ll be days like these, my mama said, when you open your hands to catch and wind up with only blisters and bruises. When you step out of the phone booth and try to fly and the very people you wanna save are the ones standing in your cape. When your boots will fill with rain and you’ll be up to your knees in disappointment. And those are the very days you have all the more reason to say ‘thank You’ ‘coz there’s nothing more beautiful than the way the ocean refuses to stop kissing the shorelines no matter how many times it’s sent away. We can face our own Great Perhaps with our backpacks full of sunshine and pixie dust of courage and never giving up. It will be scary but remember the numbers 2 – 9 of this list. Plus, know that everything happens for a reason. The Big Guy doesn’t roll a dice so don’t be afraid. He’s in control. 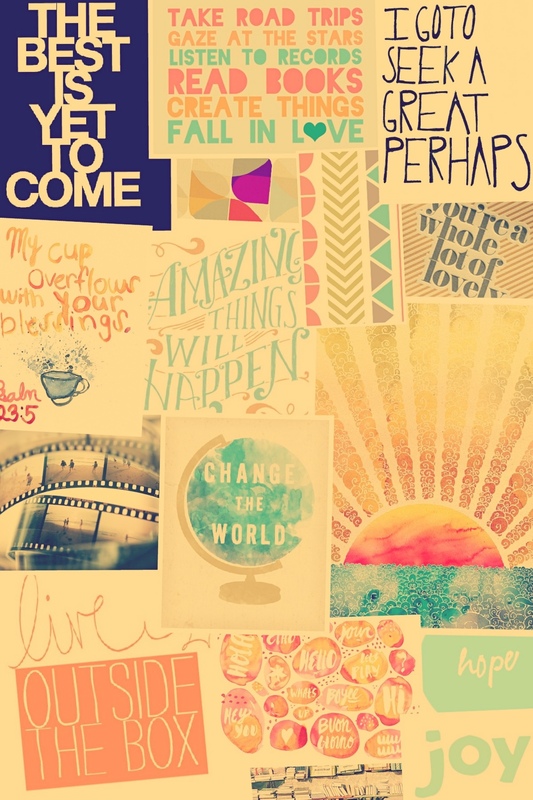 This entry was posted in Arts, Journal and tagged All Things Happy, Courage, Faith, God, Hope, Inspired, June, Moodboard, Positivity, Sarah Kay, Seek the Great Perhaps. Bookmark the permalink. Pingback: The Perks of Being a Wallflower [this is not the book] « What Is?